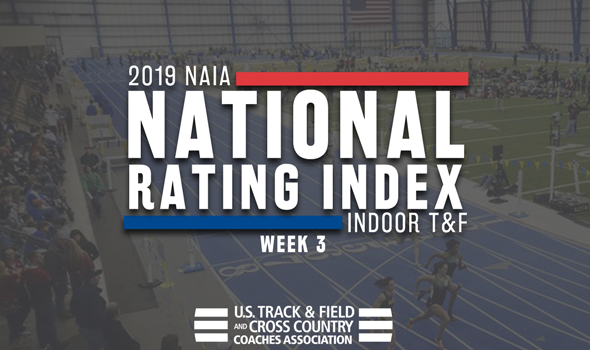 NEW ORLEANS – Believe it or not, we already entered the final month of the 2019 NAIA Men’s and Women’s Indoor Track & Field season. As teams begin to prepare for the postseason, the National Rating Index continues to take shape. Let’s take a look at what changed between Week 2 and Week 3, shall we? Remember: The 2019 NAIA Indoor Track & Field Championships will be held between February 28 and March 2 at the Jackrabbit Athletic Complex in Brookings, South Dakota. There was a trio of huge moves by teams into the top-10 this week. Wayland Baptist (Texas) soared 15 spots from No. 18 in Week 2 to No. 3 in Week 3 behind top-ranked Indiana Tech and Concordia (Neb.). Tre Hinds was a main reason why the Pioneers blazed a trail into the top-5. Hinds clocked a nation-leading time of 1:51.46 in the 800 to go along with his national-leading time in the 600 from two weeks ago. WBU also used strong efforts from its top-ranked 4×400 relay team and fifth-ranked DMR team. Keiser (Fla.) jumped 43 spots from Week 2 to Week 3. The Eagles flew from No. 49 to No. 6 right behind Doane (Neb.) after a bevy of standout performances. Rajay Hamilton and Anthony Applequist are now ranked second nationally in the 400 and triple jump, respectively, while Chris Grinley and Darian Clyburn come in ranked third and fourth, respectively, in the 60 hurdles. Dordt (Iowa) is the final team to climb multiple spots into the top-10. The Crusaders moved from No. 21 to No. 10 this week, an 11-spot step. Matthew Van Eps turned in the best mark for Dordt (Iowa) this past weekend when he clocked the nation’s third-fastest time in the 600. There were no changes to the top-4 teams from Week 2 to Week 3. Indiana Tech still headlines the group and owns a 147.62-point lead over second-ranked Concordia (Neb.). The Warriors actually extended their lead this past weekend when their 4×400 relay team took over the national lead with a time of 3:53.91, Ayanna Moody moved up to fifth in the nation in the 400 and Leondra Correia is now ranked sixth in the long jump. Southern-New Orleans (La.) climbed four spots from No. 9 in Week 2 to No. 5 in Week 3 behind third-ranked Doane (Neb.) and fourth-ranked Cornerstone (Mich.). The Knights were buoyed by Stacey Ann Williams and Kimone Hinds, who both established nation-leading times in the 400 and 200, respectively. Hinds also notched a top-3 time in the 60, while Kimona Smikle did the same in the 400. Wayland Baptist (Texas) was the next biggest mover in the top-10. The Pioneers surged from No. 16 in Week 2 to No. 7 in Week 3.